Being Where You Are explores the lives of people who volunteer for conservation organizations, those with missions supporting the preservation and protection of the natural world. This book poses some essential questions, such as: How do people connect to place? What makes them care about a place and want to work towards preserving it? What motivates them to seek out volunteering opportunities? What do they get in return when they volunteer to protect a place they love? 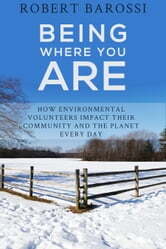 Beyond simply asking these questions and analyzing the responses, Being Where You Are tells the tales of volunteers, offering answers while relating the personal stories of these people, their volunteer efforts and the way those efforts influence the health of our planet in important ways. Conservation organizations, from land trusts to watershed associations, are especially dependent on their dedicated volunteers, sometimes making up a small army who conduct the work which would otherwise take many paid staff members. 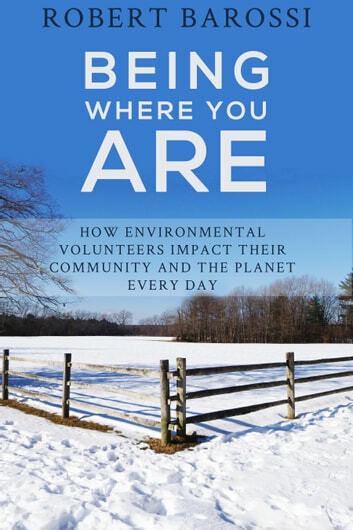 Volunteers, those featured in this book and many more like them, do everything from testing the quality of water in rivers to tracking wildlife in the woods during winter to writing grant proposals and press releases. They conduct their work in office cubicles and knee-deep in trash-strewn rivers, at all times of day, from early morning to late at night. Through their personal stories, these volunteers relate how and why they feel a deep, personal connection to a place and then act upon that connection with this kind of dedicated, tireless work. Told by the volunteers, in their own words, these are stories of giving back to the community and the planet. Stories of finding special connections to special places. Stories of the many ways that anyone who is willing and able can have a powerful and lasting impact on those places. They are stories which provide readers with an opportunity to learn about environmental problems occurring all over the world, from countries many miles away to their own back yard, and what local citizens are doing about those problems. Finally, they are stories that provide readers an insight into what they can do themselves, to get involved, give back and do their part to combat or reverse oncoming ecological crises.